There are few things that bring me more dread than the thought of recapping a game that features Jason Vargas starting for the Mets. The Amazins’ prized free agent acquisition has been awful in 2018; in three starts, he’s surrendered multiple runs in the first inning of each game. It’s no secret that the Mets, as a whole, have been struggling. But after sweeping the Arizona Diamondbacks this past weekend at Citi Field, there may be a glimmer of hope on the horizon. After defeating Arizona on Friday and Saturday, the Mets won back-to-back games for the first time in five weeks. When the completed the sweep on Sunday, it was the first time this ball club has ever swept a series without Yoenis Cespedes in the lineup (since he joined the team, of course). With the lowly Miami Marlins next on the calendar, it almost seemed like a cruel joke that Mickey Callaway and Co. were sending Jason Vargas to the mound to attempt to keep the momentum going and the turnaround flowing. But to all of our surprise, Vargas held it together tonight. In fact, he was actually pretty good. The New York Mets defeated the Miami Marlins by a score of 2-0 Monday, marking the Amazins’ fourth consecutive win and fifth of their last six. Here’s how it went. I’m really happy to see Vargas do something positive, because he was approximately two more bad starts away from a permanent residency on my dartboard. The $14 million man was good for five shutout innings Monday, only surrendering two hits and one walk. He struck out a season-high seven batters and picked up his first victory of the season. Granted, last night’s matchup was against the Marlins, who are really a Triple-A team at best, but I will take any progress at this point. We still are left to wonder if Vargas can remain effective over the course of the rest of the season, but his performance at least inspires some confidence going forward. With Vargas only lasting five innings tonight, protecting the Mets’ slim lead fell into the hands of the bullpen. Luckily, they performed admirably. Paul Sewald took over in the sixth and recorded two outs before working into some trouble. With two men on and two out, Jerry Blevins took the mound to face Justin Bour, but surrendered a walk and was lifted promptly afterward. A.J. Ramos stepped in after Blevins and got the Mets out of trouble in the sixth. With Ramos struggling of late, watching him work out of a tight jam and then returning to post another shutout inning was a welcomed sight. Seth Lugo toed the rubber for the eighth and continued to be…well…Seth Lugo, which is a great thing in 2018. The only blemish in the eighth was a Starlin Castro triple that got behind a diving Michael Conforto, but Brandon Nimmo saved the day with a diving catch off the bat of Brian Anderson to retire the side. Jeurys Familia performed his typical routine of raising out blood pressure, allowing Derek Dietrich to crack a one-out double bringing the tying run to the plate in the ninth. Thankfully, he escaped trouble after Miguel Rojas struck out and Amed Rosario made a beautiful throw on a ground ball in the hole (the play was reviewed and confirmed). With the win, Familia picked up his 13th save on the year. Asdrubal Cabrera continued to produce for this club with two more hits and an RBI. He opened the scoring in the bottom of the third, doubling home Rosario. 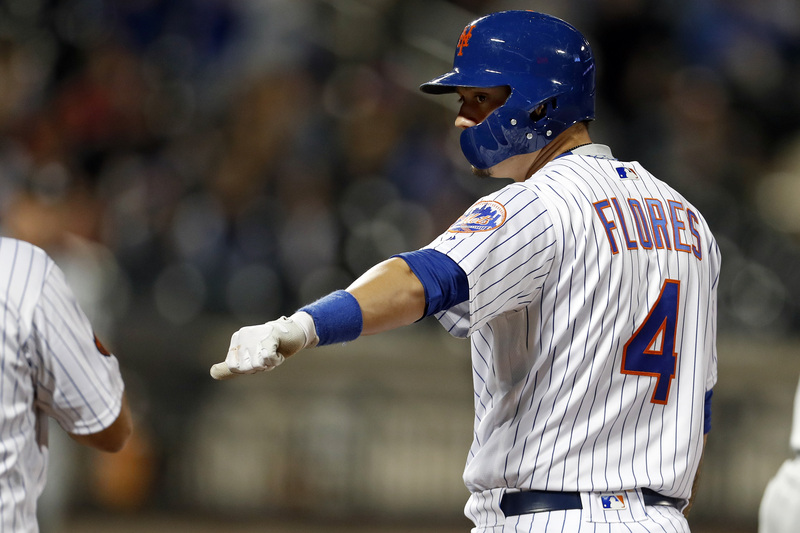 That 1-0 stood up for the duration of the game and Wilmer Flores netted an important insurance run when he singled home Devin Mesoraco in the seventh. Despite recording nine hits, the Mets were only able to scratch across two runs. You can definitely tell the offense is hurting right now with the absence of Yoenis Cespedes and Todd Frazier, among others, but the pitching held up Monday, which is all that matters. Conforto continued his climb above the Mendoza Line with two more hits, the ice cold Jay Bruce picked up a single and Mesoraco continued to prove that catchers are capable of hitting after lacing a double. Rosario is starting to look like the phenom we all expected with another base hit tonight and Philip Evans picked up his first base hit of 2018 with a pinch-hit single in the fifth. The Mets are back at it tonight for the second game of the series against the Marlins. Zack Wheeler takes on Caleb Smith at 7:10 p.m.